There are a multitude of reason why someone might want to move to France or live in France. Just ask Ernest Hemingway, Johnny Depp and Brad Pitt. Sometimes those reasons are based on nothing more than idealistic fantasies while other times they are based off more practical things such as work or family. Whatever your reasons, if you’re on the fence about moving to France or need help trying to convince, I mean explain your desire to move to France to your Family and friends, here is some ammo for you. A first hand, totally unbiased (**wink-wink) guest post by my husband Blake on why France is the best country to live in Europe. 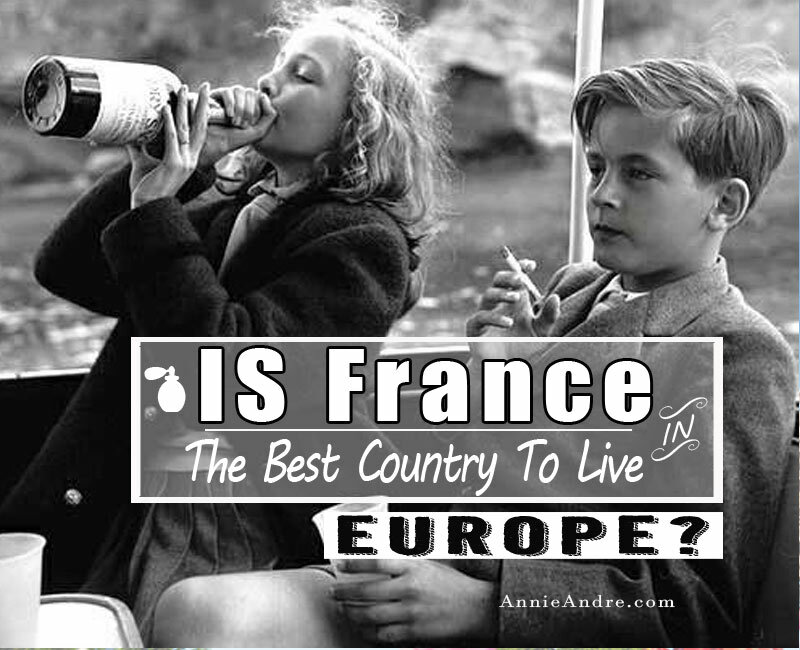 Why France Is The Best Country To Live In Europe! France is a microcosm of Europe. It doesn’t have it all, but it has most of what you’d want to see in Europe. If you have limited time and money, true for most of us, you’d do well to think about visiting only France, and skipping the rest of Europe. Why travel to England, Germany, Spain, Portugal, Italy, Luxembourg, Austria, Switzerland, Holland, Belgium, Norway, Denmark, Sweden, Finland, and Russia when you can experience those countries without ever leaving France, and not having to travel so far for the same or nearly the same experience? Country names aside, there’s a lot of descriptors to think about western end of the Eurasian landmass: northern and southern Europe; western, central, and eastern Europe; Latin language, Germanic language, and Slavic language; beer drinking or wine drinking; and so on. And add in country names, and you get more details: NATO countries, former Warsaw Pact countries, and neutrals; those that use the Euro and those that don’t; and while the American system of red state blue state doesn’t really apply here, because all Europeans, to varying degrees, believe that a people should help take care of each other, instead there are light blue countries, and dark blue countries. More than any other place in Europe, you can experience nearly all of these facets of Europe in France. Why France and only France? Start with the topography: here in this one country are waters and landscapes as good as anything found throughout Europe: the Atlantic, Mediterranean, and La Manche (the English Channel) for those looking for salt water. Indeed, France is one of the few countries that border both the Atlantic and the Mediterranean, and while you do miss out on experiencing the North Sea, the Atlantic should be cold and rough enough for those looking for that sort of thing. For those looking inland, there is the Seine, the Rhone, the Garrone, and the Loire among many other rivers, and plenty of both alpine and lowland lakes. On land it’s just as good: flats, meadows, hills, and mountains, including the highest point in Europe – Mount Blanc at 4,800 meters. There’s even a canyon, the Gorges du Verdon, just as good as the Samarian Gorge in Greece, and while there are fjords as Norway has and no steppes as in Russia, it must be said that in the case of the latter you really aren’t missing anything. For those given to a more technical classifications, the variety of France remains impressive: France has not one (like England), not two (like Germany), not three (like Spain), but four distinct climate zones- count’em: oceanic, semi-continental, Mediterranean, and alpine. France does lack the arctic climate found in Russia, but like the steppes, you’re not missing much. Looking for a particular country or experience or site? Read on. Germany and the Netherlands, also known as the lands of heavy food and beer, Two words for those thinking of travelling to these countries: Alsace Lorraine. These two regions in northeastern France shared their neighbours fondness for cabbage, sausages, and beer. Moreover, Heineken is one of the few drinkable beer sold in France, and you can find aged gouda in all French supermarkets. Portugal, Spain, and Italy: like these, France, is a Catholic country with a Latin language (those two often go together) on the Mediterranean. All have olive trees, great sea food, hot climates, and lots of great wine. Change the language and the religion, leave everything else the same, and it’s Greece. Russia? Yes, as mentioned there are no steppes or arctic climates. And yes, St. Basils in Moscow is wonderful, but why go to Russia, when instead you can see the Russian Orthodox Cathedral right on the Mediterranean in Nice? And if you want to meet Russians, they are already on the Cote d’Azur, buying up property to launder money through real estate transactions. Ireland? There are plenty of sheep and stone walls in France, and the weather is better than Ireland. And because the Irish diaspora is huge, and there’s an Irish pub with Guinness on tap in almost every town. Don’t worry, the French don’t drink real beer, so there’ll be plenty waiting for you. Scotland? There are plenty of sheep and stone walls….wait…I just wrote that. There’s not much golf in France, and the French don’t go in for men wearing kilts (scarves are okay), but whiskey is available, and instead of haggis eat some andouille which is stuffed with just about every part of the pig: lips, assholes, and all. England? No, there’s no Stonehenge in France, but there are there are plenty of primitive stone structures – carnacs, menhirs, and dolmens – throughout France. Architecture? It’s all here from Paleolithic waddle and daub replicas, to Romanesque churches, Gothic cathedrals, Art Nouveau, Modern, and so on, the only style France seems to have missed is Communist/Facist Unspired, although Le Corbusier comes close. Fashion? Seriously? Sure, Hugo Boss and Armani are nice, but this is FRANCE! You know: Dior, Chanel, Givenchy, Cardin, Vuitton, and YSL. Food? See Fashion. Disclaimer – if while here and you are looking for some different cuisine, especially Asian, don’t even try. All foreign cuisine has been modified to suit the narrow French palette, and you’ll be disappointed if you’re looking for some spicy curry or savoury pho. Cathedrals, castles, churches, museums? Too many, just like every other country, so save yourself and just stick to a few in France. Not sure where to start? How about if you’re near Paris: Chartres, Château de Vincennes, Notre Dame, and the Louvre. These are as good or better than anything in London, Berlin, Moscow, Rome, or Madrid. Looking for romance? In the south of France there are Latin dark haired dark eyed passionate Mediterranean types who will love you today and maybe tomorrow, while in the North are the Nordics – pale, blue eyed, and reserved. Comme tu veux. Remember, while France is in Europe, and a lot of Europe is in France, the converse does not hold: it’s hard to experience France in other parts or Europe. And that is why France is the best country to live in Europe. Keep it simple and travel to only France.